This follows on from last week's post on windows, and the previous week's on roof spaces. Insulating walls isn't a DIY project, except in certain limited circumstances, and then only if you're a very experienced DIY-er! Insulating your walls is well worth doing; it saves a lot of energy in heating your home, and hence reduces carbon emissions and energy bills. The first question is: what kind of walls do you have? Are they solid walls or cavity walls? Most houses built from 1920 onwards have cavity walls, and if your house was built before then it almost certainly has solid walls. Houses (or extensions) built in roughly the past ten years are likely to have cavity walls that are already insulated. A registered installer will check before doing any work, if you are unsure. The easiest way to check what kind of walls you have is from the pattern of the bricks on the outside of the house. If your home has cavity walls, the bricks will normally have a regular pattern like this. If the brickwork has been covered (with rendering or other cladding) you can also tell a cavity wall by measuring its thickness. Go to a window or door on one of your external walls, where you can see the thickness of the frame and the recess and measure there. If the wall is more than 260mm thick then it probably has a cavity; a much thinner wall will probably mean that it's solid. Cavity walls are the easiest and least expensive to have insulated. Your energy supply company can probably do the work for you, or you can find your own installer (information on doing this appears at the end of this post). Your gas supplier may be subsidising the work (to meet their own carbon reduction targets), and if you are over 60, or in receipt of certain state benefits you may be entitled to have the work done free. There are also some grants available - all details at the end. 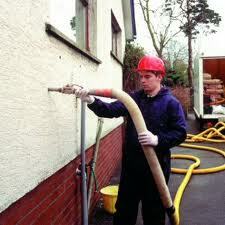 Cavity wall insulation is blown into the cavity from the outside of a house. Every part of the wall must be filled with insulation, so it's important that the installer can reach all your external walls. If you live in a mid-terraced house, the will need to run their equipment through your house to reach the back walls. A large lorry will park outside your house, and a long hose will be run from the lorry to your house. Small holed will be drilled in a grid pattern over the whole wall surface, and a nozzle inserted into each in turn. A generator in the lorry will drive a compressor that blows the material into the cavity. The holes will be filled afterwards, and a good installer will also paint over them to match the brickwork, mortar or rendering, so you won't be able to see where the work was done. The length of time needed for the work depends on the wall area to be filled, and on the ease or otherwise of access, but a couple of hours is an average estimate. If you life in a terraced or semi-detached house, your cavity may be continuous with your neighbour's. In this instance, the installers will fit a barrier from the top to the bottom, inside the wall along the line where the properties adjoin, to prevent your insulation ending up in your neighbour's walls! Imagine a very long bottle-brush on a string, with no handle . . . that's what the barrier looks like. I couldn't find a picture! CAUTION: if you have any damp patches on your internal walls then they should not be insulated until the problem is sorted out. You should speak to a builder who specialises in damp prevention about this. If you pay the full price of the work yourself, it will cost roughly £250, depending on the size of your house. It will pay for itself in two years in reduced energy costs, and will save something around 550kg of CO2 emissions per year, again depending on the size of your house and how you heat it. If your home was built before or around 1920, its external walls are likely to be solid rather than ‘cavity walls’. Solid walls do not have the gap present in cavity walls, and this allows more heat to pass through them. 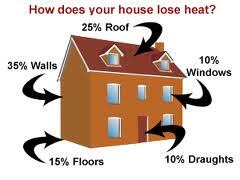 In fact, twice as much heat can be lost through an un-insulated solid wall as through an un-insulated cavity wall. But the good news is that, like cavity walls, solid walls can be insulated, either from the inside or the outside. If you look at the guest post that Harriet Martin wrote, about greening Cotteridge Friends Meeting House, you'll find a picture of internal solid wall insulation being installed. It's about halfway down the post. Internal wall insulation is best carried out when you are re-plastering your walls or you’re changing major fittings in your bathroom or kitchen. It creates a lot of work and mess, and the room(s) will need redecorating afterwards, so it's most cost-effective if it's done along with other planned work. External wall insulation will be more cost effective if your external walls need re-rendering; you may need planning permission if your property is listed or located within a conservation area. Each approach has its own pros and cons and conditions when it’s ideal or which make it unsuitable. Internal solid wall insulation will cost anything between £5K and £9K, depending on the size of your house. It will pay for itself (in reduced energy bills) in anything between 10-25 years, depending on the initial cost, the size of the property, and how you heat it. It will save roughly 1.8 tons a year of CO2 per year(again, depending on the details of the property). External solid wall insulation will cost anything between £10K and £15K, depending on the size of your house. It will pay for itself (in reduced energy bills) in anything between 25-40 years, depending on the initial cost, the size of the property, and how you heat it. It will save roughly 1.9 tons a year of CO2 per year(again, depending on the details of the property), and is slightly more thermally efficient than internal insulation. Internal solid wall insulation is usually installed professionally, and should not be attempted by the average DIY-er; only the very experienced should install it themselves. Approach an installer (see details at the end) that provides dry lining or plastering and ask them to show you what measures can be taken to prevent condensation forming on the wall structure once it is insulated. External solid wall insulation will definitely need a specialist installer trained by approved system designers. • Doesn’t alter the appearance of outside walls but it will slightly reduce the floor area of any rooms in which it is applied (the thickness of the insulation is typically around 100mm). • Is ideally installed at the same time as internal renovation work and re-plastering as this will reduce the costs of the installation. • As work is being done to the interior of the house, there will be some disruption but the disruption can be minimised by doing it room by room. • Skirting boards, door frames and external fittings need to be removed and reattached to the new wall surface. • Can make it difficult to fix heavy items to inside walls – although special fixings are available to help. • If there are unresolved problems with penetrating or rising damp, these should be resolved before installation. • Can be applied without disruption to the household and does not reduce the floor area of your home. • Renews the appearance of ageing outer walls. Planning permission may be required so check with your local council before undertaking any work. • Fills cracks and gaps in the brickwork, which will reduce draughts. • Increases the lifetime of a home’s wall by protecting the brickwork. • Not recommended if the outer walls are structurally unsound and can not be repaired. Installing rigid interior insulation boardsThis insulation technique involves fitting plasterboard backed with rigid insulation onto the inside of walls. Typically the insulation will be made of either expanded or extruded polystyrene (EPS or XPS), polyurethane or phenolic foam. The insulation should be at least 60mm deep to meet recommended standards, and can be anything up to 100mm deep. Think about the amount that this will reduce the usable size of your room. The end result depends on how many external walls each room has. Before installation, it’s crucial to prepare the wall that’s to be insulated; its surface needs to be even. Where existing plaster has been removed and the brickwork is uneven, the wall must be levelled using a layer of plaster or render. Ask your installer if they do it as part of the job. Once the wall is even, the insulation boards can be fixed straight to it using continuous ribbons of plaster or adhesive. Additional fixings should be used to hold the boards firm, and the joints between each board should be sealed to prevent air leaking out through the solid wall. With this technique, a metal or wooden studwork frame is attached to the wall and filled in with mineral wool fibre. It can then be plastered over, ready for redecoration. Mineral wool insulation, which is also used to insulate lofts, is a less powerful insulator than rigid insulation boards. So, to provide the recommended level of insulation, the mineral wool ‘filling’ needs to be at least 120mm deep. This makes stud wall insulation thicker than rigid insulation boards, which means it will affect the size of your room a little more. But on the plus side, a stud wall is strong enough to hold heavy fittings. Rather than finishing off a stud wall with plasterwork, rigid insulation boards can be added at the final stage instead. This combination of techniques will boost the performance of your insulation and reduce your running costs and risk of condensation even further. It is also a good idea if the wall is very uneven; putting a stud wall on first will reduce the time spent preparing the surface. If you’re planning to insulate your walls from the inside with insulation boards or a stud wall, then it needs to be clear of any objects – including radiators – so that the entire space can be insulated. Only external walls need to be cleared of objects, not internal partitions. Light fittings and pipe work will probably also need to be removed and reattached, so that they are flush with your new wall surface. Skirting boards and door frames on external walls will also need to be removed and replaced on the new wall and areas round windows must be insulated at the same time as the walls, to prevent condensation. For external solid wall experts, visit Insulated Render & Cladding Association (INCA) or the National Insulation Association (NIA). This latter also lists cavity wall insulation installer. There are grants and offers available to help pay for cavity wall insulation - you can search the grants and offers database (at the Energy Saving Trust) to see what's available or call your local Energy Saving Trustadvice centre free on 0800 512 012 0800 512 012. They will give you free, impartial, one-to-one advice on saving energy at home.